Spring is definitely going on in southern Arizona but Red Rubber Inspirationals is having a challenge called One Last Snowfall. I love snow (but not the blowing variety) and wanted to take part in this challenge. 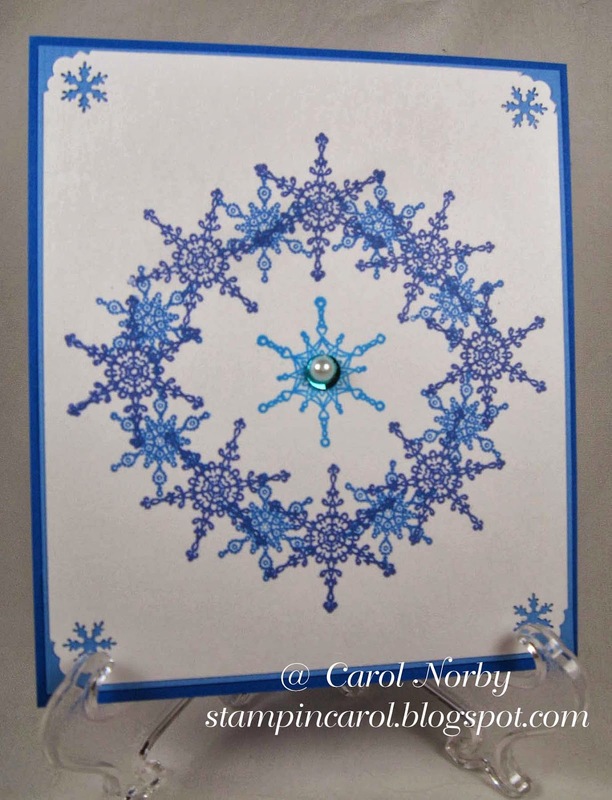 I used a stamp set called Ornamental Snowflakes by RRD. This card will be used as a Christmas card later. 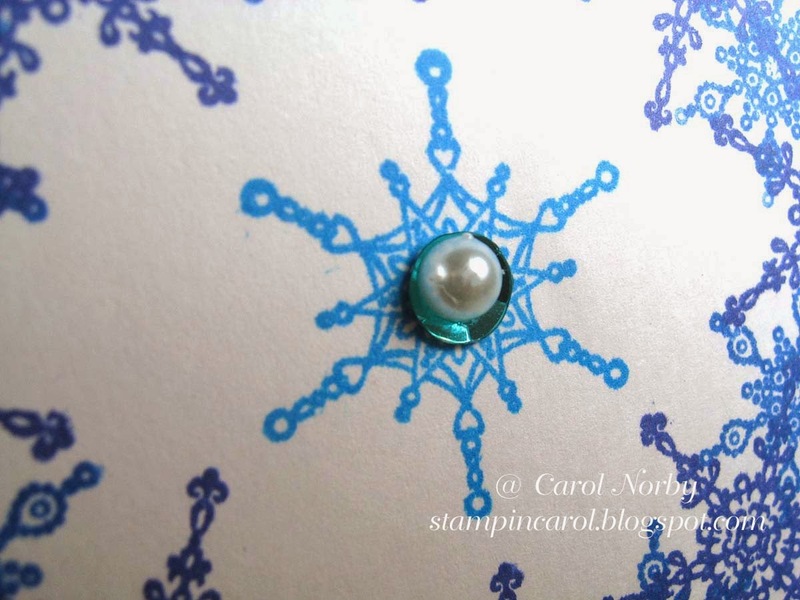 I used 3 different blue inks by Memento to stamp the flakes. I added a beautiful sequin I won from a friend with A|Muse Studios and added a pearl gem over it for that touch of bling. And I used an old Fiskars corner punch (that I've had for about 15+ years) but I see that it didn't punch cleanly on this particular corner. In fact only 1 corner punched cleanly. Hmmm.... time to get out some foil and clean this ancient punch. Anyway, head over to Red Rubber Inspirationals and check out the fun inspiration cards. That is a beautiful card. 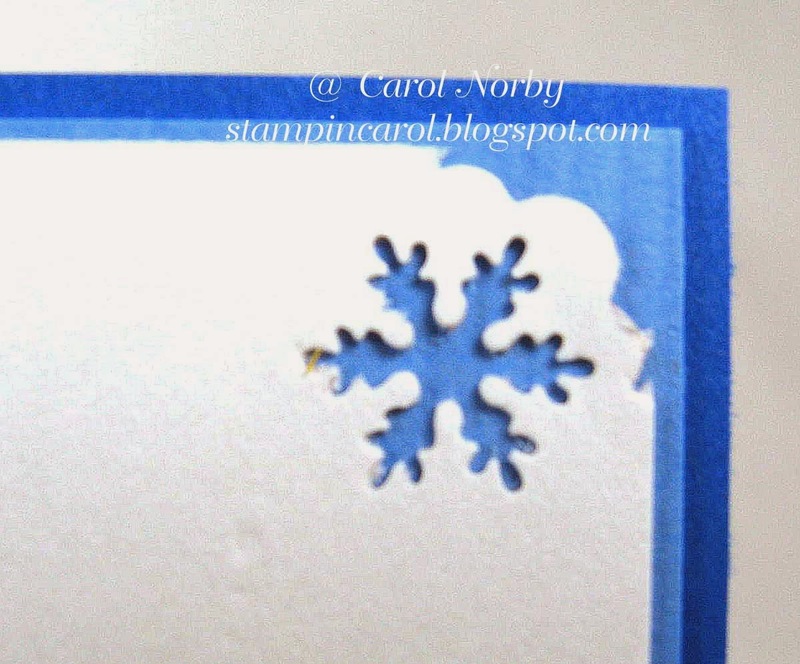 I have quiet a few snowflake stamps, so I may have to try this. I also like the corner punches and your color choice. Nice card Carol! Love your sequin pearl combo. That's one of my favorite ways to use them. Thanks for sharing! The idea of making a wreath from he snowflakes is inspired. The colors are pretty too. Beautifully done Carol!! I love how you stamped the snowflakes in different colors and in a circle!!! It's very striking!Thanks for joining us again at Red Rubber Inspirationals! LOVE! Love the set you used! Especially love how you used it! Love the large snowflake you created! Beautiful!! Thanks for joining us at Red Rubber Inspirationals! I just love the snowflake wreath you created - the different colors give it a lot of dimension. Great card!